Brief Description of Subject: This is one of four transept windows designed by Buffalo, New York, artist, Ellen Steinfeld. The artist has entitled this window "Resurrection." 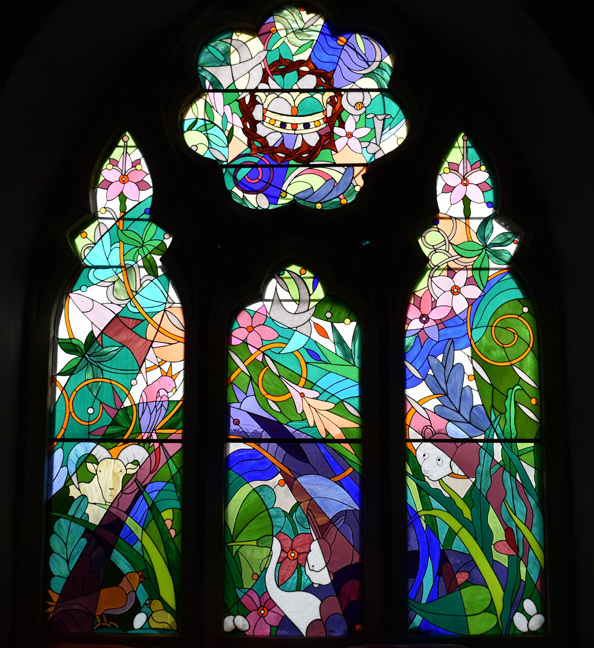 This window was "given by Margaret Hammond in memory of her parents, Kathleen and Harold Hammond. Inspiration for this design came from a purple super frontal, which Margaret's mother had embroidered for their former Church, Epiphany. The central motif was a crown of thorns representing the Passion surrounding a gold crown of glory. On either side was a passion flower. The crowns can be seen in the rosette and the passion flowers appear throughout the window. The rest of the design relates to renewal and is based on a comment that Erv Brown once made that he understood the Resurrection and return to life when he came to Michigan and witnessed the coming to life in our Spring season."